HG pilots in this area don't fly a lot in the winter time. But I happen to like xc-skiing and always like to observe our local mating pair of bald eagles. The other day while out on an xc-ski hike I noticed a large flying bird that did not have white head and tail feathers. We have red tail hawks in the area but this bird was too big for a red tail. I always carry a camera with me (that can also take 1080 HD video) and was able to capture some video. From that I captured a screen shot of what ended up being an immature bald eagle. I first confirmed this via my 10x 56mm binoculars. This juvenile bald eagle had 3-4 white feathers in it's tail with the rest being medium brown. I've attached the screen capture below. The image isn't all that impressive since I was about 1/4 of a mile from the flying bird. But it's still cool to record a probably "nearly" mature juvenile. They reach full maturity at 3-4 years of age. Since it was hanging out in this area it is quite likely to be an offspring of the "Mossy Bank" adult bald eagles. An image of one of the adults is part of SoCenNY's banner as seen above. I will also mention that yesterday 3/8/2019 I witnessed the female bald eagle laying in the nest and moving very little. My observation was from above the nest from a viewpoint in Mossy Bank Park. This is likely very interesting since mid March is when the female usually lays two eggs. However, I have never seen the female on the nest this early. The earliest time in past years was about the 12th of March. And because of loud disruptive activity in the area of the nest (in violation of State and Federal law) in both February and March of 2017 and 2018 the eagles produced no young. So, it's great to see the female laying in the nest for the first time since March of 2016. I also did a screen capture of the video I took yesterday of the female on the nest. The image is pretty granular but you should be able to make out the eagle. Her tail is to the left and head is to the right and there's a little patch of snow above and to the left of where she's laying. I've always loved observing and even flying with large raptors, so I hope my fellow members of the US Hawks will enjoy is topic. That second picture is much better!! The head is much clearer. Thanks for posting Scott. Very cool!! While boat towing on White Water Lake near Hoyt Lakes Minnesota I had just landed on Fisherman's Point in time to see the Game Warden coming my way. There were two nesting eagles at the south end of the lake that I had been staying away from due to a stiff fine if someone claimed that I was disturbing nesting eagles. Just as I was thinking the cuffs were about to come out the warden asked me to fly over the nest because he hadn't seen any activity of the two hatchlings. I was only too happy to help him out and reported back my findings. At this late date I forget what my report was but all I know is that the warden went away happy and I was way more happy then the warden was. That's a great story Bill! Beyond specific permission to fly over the nest, "aircraft" are supposed to stay 1/4 mile away. But the FAA does not define us as aircraft. We're ultralight vehicles so can the Federal 1/4 mile limitation be placed on us? 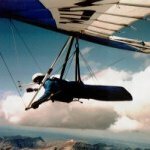 Well, after speaking with the appropriate local authority in the US Fish and Wildlife office (in MA) he decided that hang gliders were non-powered recreational vehicles - like a bicycle. They are allowed to come as close as 330 feet to an active nest site. The problem locally is that a non-governmental committee given authority over Mossy Bank Park has made a rule that hang gliders can't be flown at the park. Interestingly, the nest is at or just past 1/4 mile from the HG launch. Considering this, flying from the park involves no violation of State or Federal laws even if hang gliders WERE considered aircraft. Plus a Federal "authority" has said that as long as we can stay 330' away (horizontally and vertically) from the nest, then everything is legal. It is, in fact, very easy to stay that far from the nest site. I would also mention - That yesterday I got another look at the nest site. While observing, the male eagle flew to the nest. This caused the female eagle to stand up and move around a bit. During this activity I was able to see the typical 2 eggs in the nest "bowl". This was possible since I took my 60 x optical spotting scope with me hoping just this might happen. As I have said in a above post, in past years egg laying would happen between 3/12 and 3/15. So seeing two eggs on the 10th means that the first was laid (3-4 days earlier) on 3/6 or 3/7. That's close to a week earlier than typical. The eagles must have heard that the ground hog predicted an early spring. I'll try and get more photos today. Wish me luck! wingspan33 wrote: I'll try and get more photos today. Wish me luck! It's cool to see our national symbol through the eyes of someone we actually know!! No observations on Wednesday. But yesterday one of the local eagles flew very close to right over me. He (most likely the male) was in a thermal and climbing out. He was getting higher as I got my 18 mp Sony Cyber-Shot out and got "locked in" (not that easy to do when your view finder is the camera's rear screen). I took multiple images and one came out real nice! I've attached that shot. It's actually a better image than the one up in the banner! Meanwhile, the female was sitting on the nest as expected with only her head showing (I was viewing from the valley).